Five of Formula One's top teams have pledged to remain in the sport. BMW Sauber, Ferrari, McLaren-Mercedes, Renault and Toyota are all determined not to follow Honda by quitting F1. Honda bowed out for financial reasons, prompting motorsport boss Max Mosley to warn that cost-cutting was vital to avoid losing any of the other teams. Toyota, believed to be under pressure in the current economic crisis, said they were "committed to succeeding in Formula One and to reducing costs". 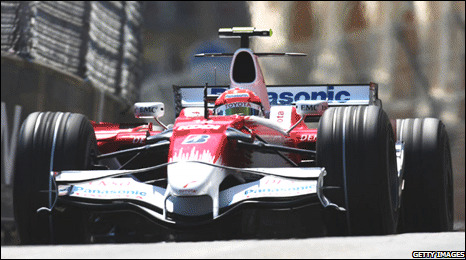 That is despite the team, who considerably outperformed Honda in 2008, scoring four times as many points and finishing fifth in the constructors' championship, axeing the media launch for their 2009 car as a money-saving measure. 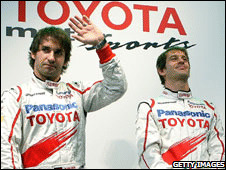 French team Renault, who finished in fourth with 80 points to Toyota's 56, also revealed they remained committed to the sport. But former F1 giants Williams, who limped to eighth place in 2008, have yet to make a statement. One of the few remaining independent teams, Williams have seen sponsors RBS, AT&T and Philips suffer heavy losses in recent months. Honda withdrew from the sport on Friday, leaving their Northamptonshire-based team just weeks to find new backers or face closure. 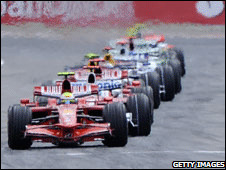 The Formula One Teams Association (Fota) met on Thursday to discuss proposals to secure the future of the sport, and said agreement had been reached on "substantial cost-cutting for 2009 and 2010" as well as "additional initiatives to improve the show". With top teams spending about £300m a year, Mosley, president of governing body the International Automobile Federation (FIA), said the sport had to cut soaring costs. Despite Mosley describing the team's cost-cutting proposals as "fiddling about", Toyota, who have one of the biggest budgets in F1, are sure they are on the right path. HOW SAFE ARE REMAINING TEAMS? Also owned by Mateschitz - how long can he sustain two teams? "We are contributing to the Fota activities which will achieve significant cost reductions, whilst maintaining the spirit of the sport," a statement from the manufacturer read. "We hope Fota's proposals and activities will be given the widespread support they deserve as they provide the sound, stable base Formula One requires at this time." BMW board member Klaus Draeger, whose team won in Canada this year and finished third overall, said in a statement that Honda's decision would have no bearing on his company's involvement in F1. "F1 involvement is an integral part of the company strategy," he added. "There is no better platform than Formula One for demonstrating our brand values. "BMW, moreover, makes targeted use of the Formula One project as a technology accelerator for series production. "With the BMW Sauber F1 Team, we have from the start focused on high efficiency and have achieved our successes with a compact and powerful team. The cost-benefit ratio is commensurately positive." Norbert Haug, the head of Mercedes Motorsport which powered Briton Lewis Hamilton to his recent title victory, also revealed his team were working hard on measures to reduce costs. "Our Formula One involvement is built on financially solid foundations and is in large part financed by our sponsoring partners," he said. "Mercedes-Benz's contribution is cost-efficient, the resonance in the media and in the public which last season and Lewis Hamilton's win generated was worth many times our financial investment." He added: "This pullout is very sad. It only shows how important the cost-cutting measures are that we've been advocating for more than five years, and which have only been realised to a small degree. Could we realistically be looking at a 14-car grid in Melbourne? "Within the Formula One Teams Association, we're working very hard on measures to cut costs, and over the next two years we must achieve cuts of at least 50%." Luca Cordero di Montezemolo, chairman of Ferrari, one of the sport's strongest and most secure teams, remained positive about the sport's future. "We unanimously agreed to important short and long term measures, for 2009 and 2010," he said. "We gave a new push toward a reduction in costs especially to help the smaller teams already from the next season." Red Bull, Toro Rosso and Force India operate under a separate financial model, relying on funding from billionaire owners to finance their campaigns, and are not believed to be in difficulty.